Despite Sony and Microsoft’s growing influence over the video game industry, it seems like the eighth generation of video games is not all about the PlayStation 4 and Xbox One consoles, as Valve is soon going to join in on the fun with its forthcoming pre-built console-like gaming computers known as Steam Machines that are only months away from landing in gamers’ living rooms. Alienware Alpha, a similar living room gaming hardware platform is already due in just a few weeks, and below is a general graphics comparison that shows how it performs graphics wise compared to the latest PlayStation 4 and Xbox One consoles. While Sony and Microsoft are busy taking over the living rooms of gamers with their latest video game consoles, Valve Corporation is getting ready to create an empire of its own with the upcoming PC-like gaming consoles known as Steam Machines that are being manufactured by a number of vendors using efficient off-the-shelf computer parts and a range of different design specifications. The Steam Machines were expected to give a hard time to the latest consoles this year but the full market release was delayed until 2015, so it is just about a matter of months before we will be able to see some powerful PC hardware stuffed into living room entertainment boxes going up against the latest video game consoles. Alienware, however, is launching its sleek-looking Steam Machine known as Alienware Alpha this year in just a few weeks from now, despite the fact that SteamOS, which is the primary operating system for all Steam Machines, is still not ready to ship out. The PC-like gaming console will rather ship with Windows 8.1, Steam, and some additional features developed in cooperation with Valve that will allow Steam features such as Big Picture Mode to interface with it. Alienware Alpha will come with different design specifications ranging from moderate to high-end, and starting from $550 base model. The base model of Alienware Alpha costs a $150 more than the standard PlayStation 4 or Xbox One console bundle, so it is pretty much comparable to the latest consoles as it does offer off-the-shelf PC hardware for that extra price. The base model comes packed with a 2.9Ghz Intel Core i3 CPU, 4GB of DDR3 RAM, 500GB of hard drive storage, and a slightly turned up Nvidia GTX 860M Maxwell GPU with 2GB of video memory. These specifications are modest, so it won’t be very unfair if we compare the performance of Alienware’s machine with the latest consoles and see how it stacks up against its competitors. To see how the $550 base model of Alienware Alpha holds up against the latest consoles, Gamespot compared its graphical performance with the PlayStation 4 and Xbox One’s visual offerings by running a few video games side-by-side across the platforms. Instead of pushing games to their highest settings on the forthcoming Steam Machine, each game was tuned to achieve best frame rate without dropping the visual quality. The end results show that despite its lower hardware specifications, Alienware Alpha stays on the ground quite well against the PlayStation 4 and Xbox One. 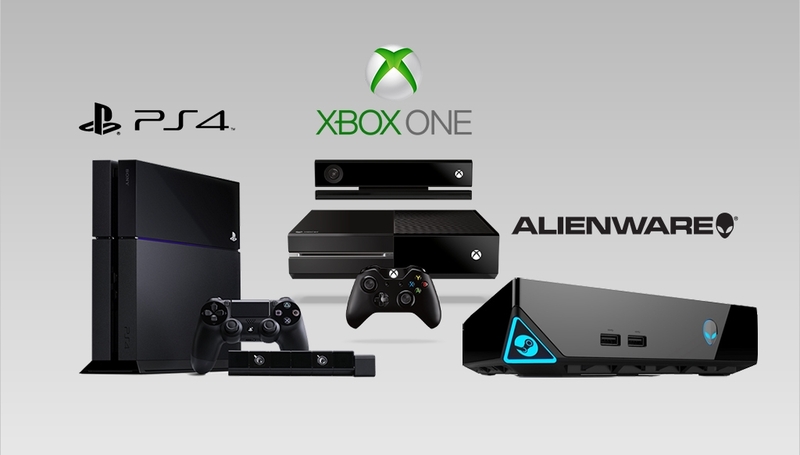 Check out the graphics comparison between Alienware Alpha, PlayStation 4 and Xbox One for yourself below and see how each platform performs. What do you think about the graphics comparison between Alienware’s upcoming Steam Machine and the latest consoles? Share your thoughts in the comments section below. Check out Alienware’s YouTube channel for more videos of Alienware Alpha in action, and stay tuned for more news and information on the PC-like console.